What is it? – HRmageddon chronicles the battles that ensue when employees from rival corporations Gray Solutions and Beige Dynamics are forced to engage in office warfare for job security after the companies merge. Who made it? – The title was developed by Thup Games for AdultSwim. How does it play? 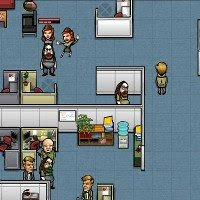 – Players begin by building a team of six office workers using a predetermined budget. Different worker-types include Managers, Receptionists, IT Guys, and Salesmen. Each type of worker has its own sets of abilities, movement rate, and defensive rating. The way you choose to build your team will impact the options available to you on the “battlefield.” For example, Receptionists have a variety of special attacks and a ranged attack, but have a slower movement rate. Managers are the only workers with the power to heal other units, and IT Guys have a couple of “area of effect” attack types. Power-ups can also be collected for extra bonuses, and attacking while in close proximity to a teammate or captured cubicle will net extra damage or defensive bonuses. Victory is achieved either by taking over the majority of office cubicles, or by “terminating” all members of the opposing team. Presentation – The art style, animations, and sounds are all fantastic, and each of the many different office battlegrounds is filled with tiny details – from conference rooms, to water coolers, to individual office decorations. In fact, it’s rare to see two cubicles decorated in the same way, and the office layouts seem practical and lived-in. Positives – Visually and aurally, the game is exceptionally polished, and the character animations (while minimal) are pretty funny. Under the polished exterior is a very solid and well-balanced strategy game that stands out as one of the better turn-based combat games out there. Negatives – Though all of the different attacks and special moves are animated differently and there are a few ranged attacks available, much of the combat is a “toe-to-toe” affair. It would have been nice to have even more attacks and abilities available, but that’s not to say the gameplay isn’t very well balanced. It is. Why you should play it – HRmageddon plays like many turn-based strategy games, but uses an interesting setting and some humorous twists, coupled with some excellent production values. There’s also a nice variety of levels, and the different workers and their abilities compliment each other nicely. Just don’t forget about our handy-dandy “boss button” if you decide to play at work, lest you unleash actual HRmageddon.